There's not an inconsequential cloud here. They are things of marvellous substance. Sunlight blares between. Such loud weather. 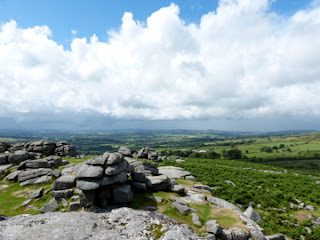 It calls us to the moors, to seek a good walk and a vantage point. Once I saw the glow-edge of the Northern Lights: the sky was shaded purple: it quite surprised my eyes. 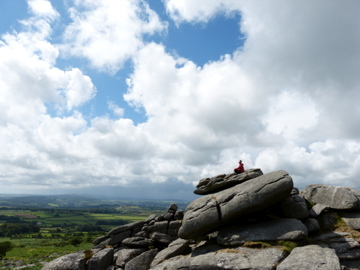 From the top of Feather Tor, in the unnerving tug of wind, the shades of this heaven are not unexpected, yet hold that thrill. After deeds of mild daring and a vanilla cone, we drive slowly home in phenomenal torrents. Sky may astound but I'm astonished by the photos --a solitary figure looking down at the moor. It is a Frederic Dorr Steele illustration come to life. One almost hears the howling hound of the Baskervilles! You have reached the mystery lover in me. Delightful! Every time you write, your blog is a delight to read. Life in poetry, descriptions in emotion. Love!